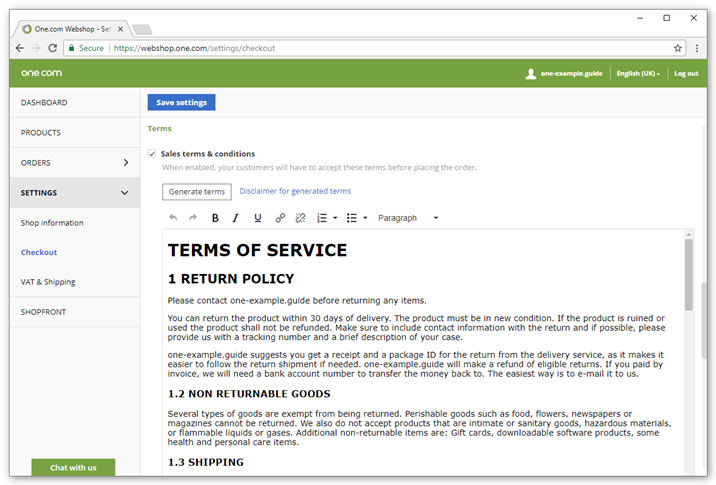 You can add terms and conditions to your online shop, that need to be accepted by your customers. Click Settings and then Checkout. Scroll down to Terms and check the box for Sales terms & conditions. Enter the terms you want your customers to accept. Click Save settings at the top of the screen. After your customers have entered their contact details, they now need to check a box to accept your terms and conditions, before they can complete their order. Tip: Click Generate terms to automatically create ready-made terms for an online shop. You can then customize them to fit your specific shop. How can I add more details to the order confirmation?